The purpose of the campground program is to ensure a clean, safe, and sanitary environment within the various campgrounds in Warren County. 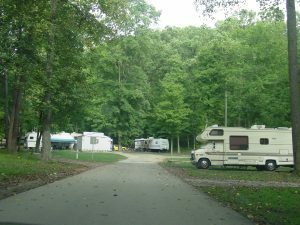 Campgrounds in Ohio are regulated under the authority of Chapter 3729. of the Ohio Revised Code (ORC) and Chapter 3701-26 of the Ohio Administrative Code (OAC). The Ohio Department of Health reviews and approves engineered plans for campground construction or substantial alteration. All campgrounds are inspected at least once during their operating season. Any tract of land used for parking five or more self-contained recreational vehicles and includes any roadway, building, structure, vehicle or enclosure used or intended for use as part of the park facilities and any tract of land that is subdivided for lease or other contract of the individual sites for the express or implied purpose of placing self-contained recreational vehicles for recreation, vacation or business. “Recreational vehicle park” does not include any tract of land used solely for the storage or display for sale of self-contained recreational vehicles or solely as a temporary park-camp. Any tract of land upon which five or more portable camping units are placed and includes any roadway, building, structure, vehicle or enclosure used or intended for use as part of the facilities of such camp. A tract of land that is subdivided for lease or other contract of the individual sites is a recreation camp if five or more portable camping units are placed on it for recreation, vacation or business purposes. “Recreation camp” does not include any tract of land used solely for the storage or display for sale of dependent recreational vehicles or used solely as a temporary park-camp. Any tract of land upon which a combination of five or more self-contained recreational vehicles or portable camping units are placed and includes any roadway, building, structure, vehicle or enclosure used or intended for use as part of the park facilities. A tract of land that is subdivided for lease or other contract of the individual sites is a combined park-camp if a combination of five or more recreational vehicles or portable camping units are placed on it for recreation, vacation or business purposes. “Combined park-camp” does not include any tract of land used solely for the storage or display for sale of self-contained recreational vehicles or portable camping units or solely as a temporary park-camp. Any tract of land used for a period not to exceed a total of twenty-one days per calendar year for the purpose of parking five or more recreational vehicles, dependent recreational vehicles or portable camping units or any combination thereof, for one or more periods of time that do not exceed seven consecutive days or parts thereof.